Club Penguin Cheats by Mimo777 Club Penguin Cheats by Mimo777: Club Penguin Times Has New Rockslide Info... NOT! Wow, the Club Penguin Times has two articles about the rockslide at the Mine and the Underground and all they say is check back for more details later! Really, Club Penguin? You can't tell us more than that? We know NOTHING more! Although, it does look like the worker in the first picture is a little surprised by the puffle. Hmm... new puffle in the Mine maybe? Oh well, at least we know there will be a new Better Igloos catalog tonight and a new Cave iggy! Sweet! Let me know what kind of cool things you will be looking for in the catalog! it will be a yeti cave! Rofl I heard its a yeti cave! that doesn't tell us much info but ok. Remember Guys, Try to Think of even more ideas!!!! Hmm... I don't know what it will be, but that stinks!! CP should tell us more about it. Just remember that CP are try to help us, but if they tell us to much then we just get bored with it and we stop, so they can't tell to soon. We have an issue on the CPG10 Prez debate: The time has been moved from 3:00 pm CP time to 3:30 pm CP time. Cool? i think it will turn into a cave for a cave penguin themed party. Hey Mimo maybe this is connected to a new card jitsu game! The miner is also wearing a card jitsu belt! Club Penguin don't put ninja stuff in the newspaper for no reason at all! i think its a new room like a cave or something that will bring a cave party!! Pink puffles like water and there was a pink puffle in the pic... it may be an underwater cave or a yeti pool!!! The brown puffle is digging up the cave and thats the reason why the puffle is brown because of all the dirt and mud in the mine. So this explains the cave party and the brown puffle rumor. what ya think? I know!!! This is my idea. I think since the orange puffle is coming out in Febuary!!! That u will find a orange puffle in the coming out of the rockslide. And it will be a Miner Puffle!! wow cool but the cave iggy is sounds better. a yeti cave would be so cool but i dont know what would be there. the white puffle is glowing or is that just the flashlight? No problem! I will so be there! Remember, everyone, dress blue if you want me, Hnw, to win, or red if you want Sy to win. Hope to see you there! 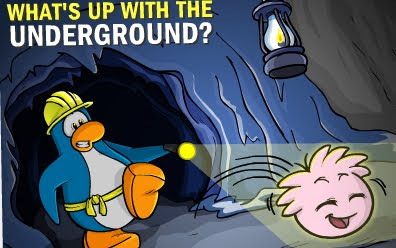 MAYBE THE PUFFLE GLOWS WHEN IT GOES IN THE MINE?! THAT'S GREAT!!! I love Greece!! Actually, I AM 80% Greek, so I support your group!! Waddle On! GREAT THEROY!!! It really makes sense now, cuz of the way you put it!! Only one question, if the puffle was brown, that would be from dirt, and if you wiped the dirt away, would it just be a regular puffle!! ________--_________----______________----_______- I think that is there because it shows an average- Joe penguin exploring the rockslide, not some reporter. EXCELLENT THEROY! It actually makes perfect sense the way you said it, maybe it will lead to a secret underground room in our iggys when we adopt it, so it can live comfortably! I think it's just a flashlight. HEY MIMO I BET IT IS A NEW BROWN PUFFLE. HE PROBABLY LIKES DIRT AND BEING UNDERGROUND HENSE HIS BROWNESS!! Hmmm, i wonder what this could be.....could this possibly be the "new storm"? The puffle is glowing, so maybe a ghost puffle in a haunted mine? Wht about the new mission!?!?!? Wow! Nice thought, that would be super cool! And since Cart Surfer is the most popular game on CP (I know my CP facts!) they've gotta improve it right? Yeah! Or it could be an orange puffle! Those would both be adorable to see them with little heard hats on and little jackhamers...Wait GASP they don't have APOSABLE THUMBS! OR HANDS! YEAH! That's GOTTA be it! i'm guessing but i think its the cave with the polar bear it was on one of the missions. Rosy 88 says " MIMO MIMO I GOT IT!!! !Ok here is my guess first of all it is a yeti cave appearently and that penguin in the picture is shocked by the puffle right? WEll a while back Herbert had a plan with puffles (I am guessing that he is hiding them in there) And that giat drill he had maybe he repaired it and dug a cave! MIMO! Random theory! The new puffles live in underground colonies and have just now started to expand right into the mine! The rockslide was caused by their digging! HAH! hey there are two rare things in that picture: the glowing puffle and the belt of the penguin miner. I have a theory. Maybe the brown puffles wil be found in the Yeti Cave as brown would be the ideal colour for camoflage underground as it would blend in with the dirt very well. Maybe the puffle in the picture senses it's brother (the brown puffle) and gets very excited making the miner a little worried what is down there. If you like my theory feel free to use it just give me some of the credit (my penguin name, Simon Luigi, would be nice in the article). No the penguin in the first pic got scared of the puffle. The penguin didn't know the puffle was there. That is an average, out of the blue normal penguin, sorry. The puffle looks like it's glowing! look the penguin is wearing a ninja belt could have something to do with card jitsu or maybe the mission will have card jitsu in it! maybe. good thinking! they should make a penguin puffle where a puffle dresses like a penguin. lol! that would be so funny!